The three tiered, amaretto wedding cake was made with a basic yellow cake recipe with amaretto extract or you can use amaretto liquor. 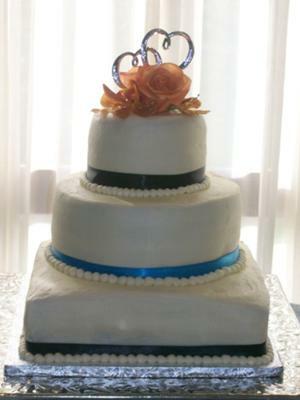 The tiers were 12, 8 and 6 layered and iced with cream cheese frosting. This is the brides cake that complimented the grooms handcuff cake I uploaded earlier. Nancy, thank you so much. I value you opinions and I know you will do a wonderful job on your anniversary cake. Your encouragement has gotton me through some scary cakes. I can't wait to see your anniversary cake. VERY NICE CAKE ANN, I AM GOING TO TRY AN ANNIVERSARY CAKE IN JULY, I'M SCARED BUT HAVE A PLAN FOR IT ALREADY. I BOUGHT HEXAGON PANS THIS MORNING AND AM GOING TO DO TWO TIERS, RED VELVET AND CREAM CHEESE FILLING AND FONDANT ON TOP. MAUVE WHITE AND GOLD FLOWERS. I SURE HOPE IT TURNS OUT AS WELL AS YOURS. THAT IS SIMPLY BEAUTIFUL..CONGRATS TO YOU AND YOUR WORK YOU ARE DOING. LOVE NANCY OF CA.